Can you advise me on the best way to take and cut thyme from plants in the garden - how and where to cut? My husband instructs me each time, but each time it is a different way, hence leads to frustration!! Thyme can be cut at any time during the spring and summer to harvest. Harvesting thyme is easy. Simply snip off what you need for your recipe. Once a thyme plant is established (planted a year), it is very hard to over harvest the plant. 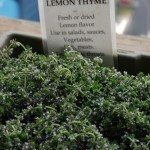 If you have just planted your thyme, cut back no more than 1/3 of the plant. It is best though to stop harvesting thyme about 3-4 weeks before the first frost in order to allow the more tender stems to harden off some before the cold comes.